A. 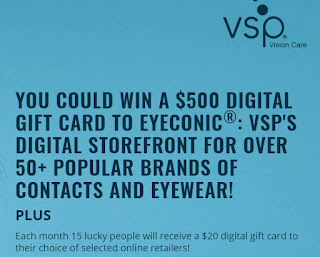 Grand Prizes (4; 1 per Entry Period): The grand prizes (each a “Grand Prize”) are as follows: Entry Period Grand Prize Number of Prizes Available Approximate Retail Value (“ARV”) of Prize 1 A $500 Eyeconic.com Gift Code (terms and conditions apply; one-time use unique promo code with a value of $500 and can be used for contacts and or eyewear) 1 $500 2 A set of smart carry-on luggage (two  carry-on pieces) 1 $450 3 A $500 gift card to Hotels.com 1 $500 4 A pair of wireless noise canceling headphones 1 $348 No more than four (4) Grand Prizes will be available (one  per Entry Period). B. First Prizes (60; 15 per Entry Period): Each first prize is a $20 OmniCard digital Gift Card (each a “First Prize”). Terms and conditions of digital Gift Card apply. The ARV of each First Prize is $20. Sixty (60) First Prizes will be available, Fifteen (15) per Daily Entry Period.